THIS EVENT HAS BEEN POSTPONED TO APRIL 4, 2010. 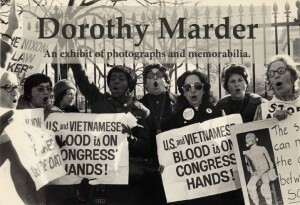 Dorothy Marder was a peace activist, feminist, and gay rights advocate. Her freelance photography offers a glimpse into activism during the 1970s, 1980s, and 1990s. The Kitao Gallery is a student gallery located on the Swarthmore College campus between Sharples dining hall and Olde Club.